Leatherette Suitcase Trunk. An Art Deco Revelation of England small sized leatherette. suitcase trunk with 3 hangers and rails. REVELATION REV-ROBE. Circa 1930's. (WHD) size, Approx. Length : 65cm # width :36cm # high :17cm. A superb large sized genuine antique wood bound travel trunk with inside tray in good original condition. Travel Trunk Chest. Antique leather Finnigan Maker Manchester trunk. Finnigan was a well known luggage crafter out of Manchester England and later moved on to London. The trunk has the initials W.T.C at each end. Leather bound corner Travelinglabels in place Stamped with initials W.T.C. Large Leather Trunk - Watson Maker. A Victorian (c. late 19th Century). A 19th century large leather trunk with heavily reinforced leather corners. 30.3 in (77 cm ) W x 17.7 in (45 cm ) D x 15 in (38 cm ) H.
Hermes vintage suitcase . Condition is Used. 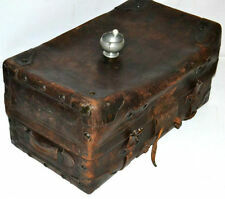 Very rare wood and linen Suitcase Height 45 cm Width 70 cm Depth 21cm. No key. Fair condition outside slight dirt. Lining on interior has some water damage. Renovation work on a house in Haute-Vienne France uncovered this Gem in the attic. REVELATION London. of Revelation Suitcase Co. 26 in (66 cm ) W x 17.3 in (44 cm ) H x 3.5 in (9 cm ) D. 23.6 in (60 cm ) W x 15 in (38 cm ) H x 3.5 in (9 cm ) D.
Victorian Tin Travel Trunk Chest. for photo's, clothes, paperwork, and/or coffee table. THE TRUNK IS IN SOUND CONDITION AND THERE IS NO MOULD. THIS TRUNK WOULD MAKE AN EXCELLENT COFFEE TABLE, GREAT POTENTIAL AS A COFFEE TABLE WITH STORAGE. CHECK IT OUT! Louis Vuitton hatbox trunk over 80 years old, family owned for many years and always used for decoration in our bedroom. A piece of art and quality that always draws attention because of the rarity and shape as it’s very tall for a hatbox and perfect for side table. Of course it’s 100% genuine and original with stamps and authenticity label. The main lock has a serial number as well as the interior of the trunk. Get Free Quotes. WIDTH: 16 1/2". TALL: 29 1/2". Plastic on hardware and natural leather. By Army & Navy Co-Operative Society Limited,Society's Works in Edwardian period. A large sized genuine antique leather bound travel trunk considered to be produced. 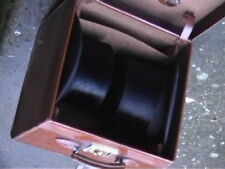 30.3 in (77 cm ) W x 18.9 in (48 cm ) D x 15 in (38 cm ) H.
Large Vintage Double Leather Hat Box Carrying Case - HATS ARE NOT INCLUDED.. Traditional Mossman UK Vintage 33" Storer Luggage Case Storage Trunk 33"x20"x16"
Gold locks and detailing. With green Henrys London protective cloth bag. Henrys London gold label inside, fully lined. This is a large Gladstone style bag/case/ Shirt Bag in the highest quality leather and finish. 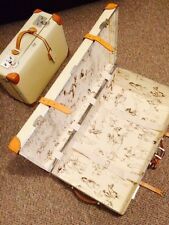 This is a Lovely Original Antique Suitcase. Vintage Soft Calf Hide English Leather Travel Suitcase. Made by "Harrods London"
Made by "Harrods London". "HARRODS Ltd MAKERS LONDON". Gold Embossed Harrods Ltd London. A fine quality Soft Calf Coach Hide leather case by-. make Supersized seem small. Get images that. A charming Louis Vuitton hard-sided case, second half of the 20th century. Very unusual shape and size, the exterior finished in the famous monogram canvas with brass fittings, and a crested monogram suggesting it most likely belonged to a noble European family. A great piece for use today or as an item for the home. Traditional Mossman Made Vintage 33"Hand Trunk Luggage Case Storage 33"x19"x12"
LIprosta Beaded Travel Cabin Trunk Circa 1900s . Here is a really nice old cabin trunk, from around the turn of the century, 1900s . All original , oak beading, canvas covering, material insides , and leather handles x2 . It’s in great condition for its age . The maker is liprosta of Dresden Germany. (See pics) . The measurements are length 31 3/4 inches, width is 21 1/2 inches, height is 17 inches. Any questions pls ask, many thanks. A circa 1940~50's large sized brown leatherette luggage suitcase. Brown Leatherette ExpandingSuitcase. has brown leather handle and reinforced corners. 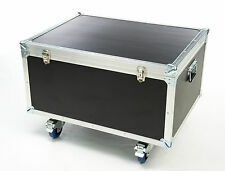 28.3 in (72 cm ) W x 17.3 in (44 cm ) D x 8.7 in (22 cm ) H.
Very Attractive Black CrocPattern Suitcase Storage with working Key. Not to much more you can say about this case other than very desirable. The handle and catches are perfect 👌. LeatheretteSuitcase Trunk. 25.6 in (65 cm ) W x 16.5 in (42 cm ) D x 8.7 in (22 cm ) H.
New listingLIGHT GREY LAMINATE Traditional Mossman School Tuck Box Trunk 20"x13"x11"
Mossman trunks have been hand built in Great Britain since around 1938. British Mossman Trunks. In the current climate Mossman pride themselves on being competitive without compromising on quality. With this item you are purchasing we are confident that you will not find a 'like for like' UK manufactured trunk cheaper. Small Suitcase Trunk. MARTIN OF ENGLAND. 22 in (56 cm ) W x 18.1 in (46 cm ) D x 6.7 in (17 cm ) H.
Green LeatheretteSuitcase. 20.9 in (53 cm ) W x 12.2 in (31 cm ) D x 6.3 in (16 cm ) H.
Around the turn of the 19th and 20th century Louis Vuitton had established himself as a market leader in trunk making and needed to set his now famous brand apart from the imitators and competitors. They decided to come up with a logo, a monogram, which was indeed the famous and very recognisable print we are so familiar with today. The very first run was only made for about six years and the print was woven into the canvas. This example dates to around 1900 and is a perfect example of such trunks. 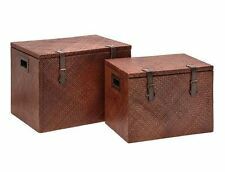 With its leather trim, brass studs, fittings and locks it still shows the same elegance as it did well over 100 years ago and is a testament to the durability of the best trunk maker in the world. Today it makes for a wonderful piece of interior design, both decorative and useful. The Trunk has one catch the central lock has been removed. But this does not affect it functionality at all. If you have a tight budget this Trunk looks the part its chic and it's clean each leg has five screws and are easily refitted. Here is a old liprosta Circa 1900s travel trunk, oak beaded, canvas with leather straps . (See pics) . It’s in good condition with all original fittings, 1 that’s not on the front , the black 1 . Has makers tag on 1 end. Measurements are length 36 inches, width is 22 inches/ and depth is 13 inches. Any questions pls ask. Many thanks. RED Traditional Mossman Boarding School Tuck Box Storage Trunk 20"x13"x11"
Army & Navy Co-Operative Society Limited. 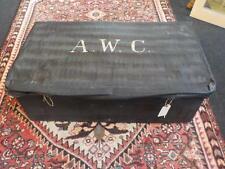 A large sized genuine A&NCSL leather bound travel trunk. Society's Works. Circa 1910. 36.6 in (93 cm ) W x 17.7 in (45 cm ) D x 13.8 in (35 cm ) H.
Made from strong polycarbonate PC hardshell. Top and side grab handles. With luggage stickers has brown leather handle. Brown LeatherSuitcase. I have a pink Trunki for sale it’s used but with only a few marks and includes the strap and key. BLACK Traditional Mossman 36" Steamer Boarding School Luggage Trunk 36"x20"x14"
UNION JACK Mossman Traditional British School 20" Tuck Box Trunk 20"x13"x11"
Matthew Rose and Sons. 20.1 in (51 cm ) W x 16.1 in (41 cm ) D x 14.6 in (37 cm ) H.
BLUE CARPET Traditional Mossman Boarding School Tuck Box Storage Trunk 20x13x11"
Item Code: Bedford Tan. 100% Real Leather.